I have never had much of a sweet tooth, and first thing in the morning I especially struggle with anything very sugary. Even as a kid, the idea of Coco Pops or Frosties for breakfast was loathsome (I know, what a weird child). Not that it’s a particularly bad thing, but I largely blame my mum for my aversion to an early doors dose of the sweet stuff. During my formative years in Singapore, breakfast often meant unending rounds of dim sum with the extended family, or gloopy rice congee, heavily laced with soya sauce, spring onions and the greeny-black translucent glint of a somehow prehistoric looking century egg – a salty, gelatinous preserved egg that defeated all but the most intrepid of my university friends when we moved to Beijing. However by far my favourite breakfast was our Sunday morning ritual of heading to Little India for curry, roti prata and hot cups of teh tarik (delicious, milky, pulled tea). French toast and pancakes pale in comparison, I promise! Lovely as these breakfasts are, they are not exactly epic for the waistline/arteries/ability to function for the rest of the day without a long nap. Now, on days when I have enough time to make a proper breakfast, I almost always head for the eggs. 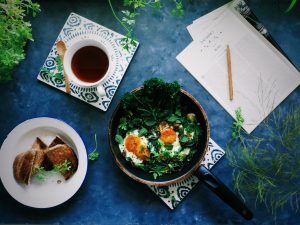 Sweet potato and spinach hash with poached duck eggs, punchy huevos rancheros or a delicious, lightly spiced shakshuka. If you haven’t met a shakshuka before, it is a wonderful egg-based, one-pan-wonder popular in the Middle East, particularly in Israel. Traditionally it uses a tomato base, laced with fragrant cumin, in which eggs are gently poached. 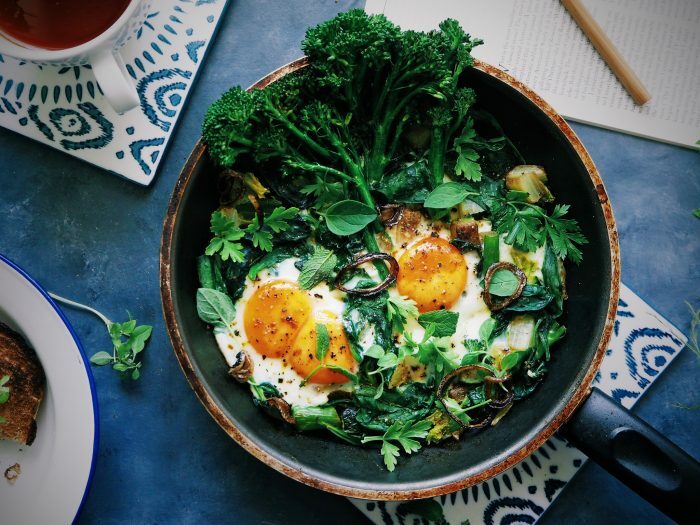 However, feeling a bit tomatoed out at the minute and what with Mr Sticky Toffee Tofu training to be a dietician (and aiming for around 300-a-day, vegetable wise), this time I opted to make a less traditional, but undeniably healthy green shakshuka. 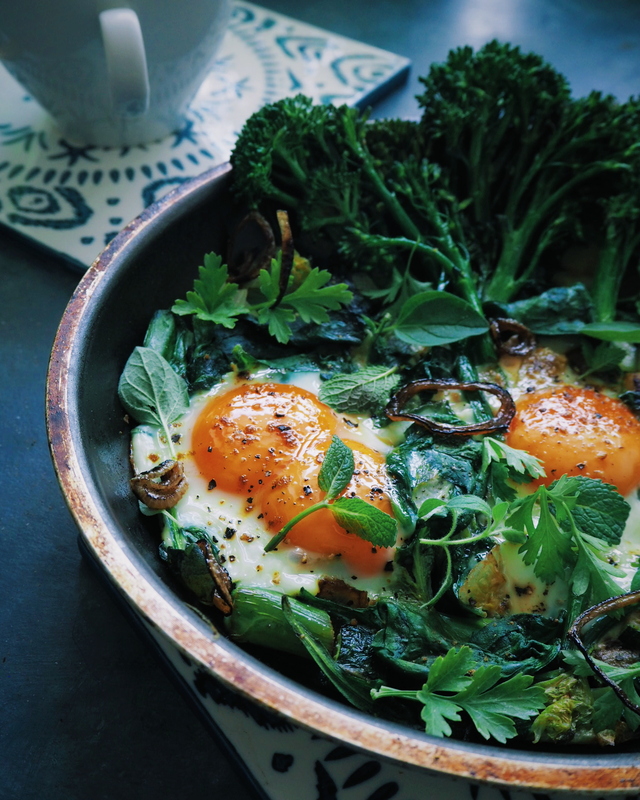 The cumin-spiced spinach, courgette and broccoli are delicious with the creaminess of the still runny egg yolks and a liberal scattering of roughly chopped mint and parsley add a lovely freshness. There will always still be times when all I want for breakfast is a large vat of curry or plates of fried dim sum (I’m still an unashamed glutton from time to time) but this pan of green-goodness is the perfect, healthier alternative for those who aren’t enormously partial to a sticky pile of French toast or frankly to anyone who wants to avoid a chronic case of the Sunday morning, beached-sealesque food coma. 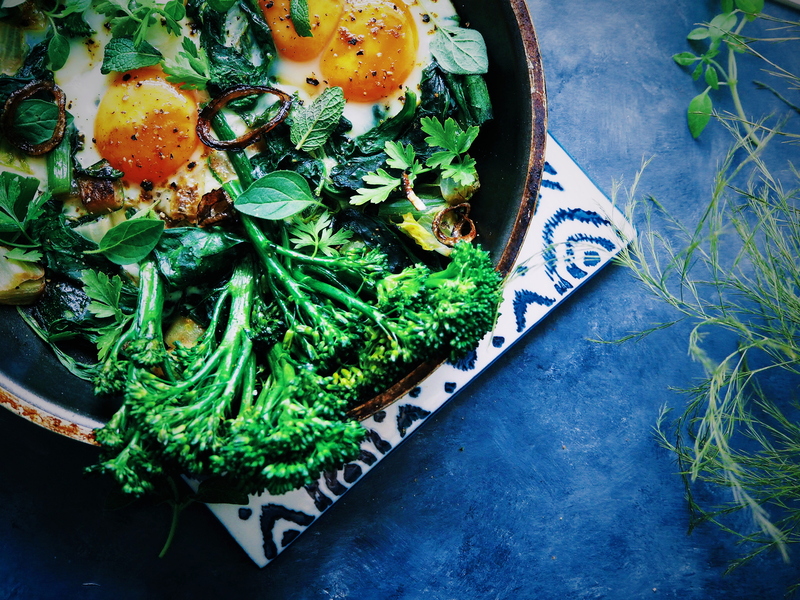 The word shakshuka translates as ‘all mixed up’ so feel free to substitute any greens you fancy, or use it as the ultimate vegetable drawer clear out meal. Heat a small frying pan for a few minutes before adding the cumin seeds. Keep the pan moving until the seeds are lightly toasted and aromatic. Transfer to a mortar and pestle and grind to a course powder. Blanch the tenderstem broccoli in boiling, salted water for a few minutes (until just cooked) and refresh in iced water. Gently heat the olive oil in a large, non-stick frying pan and add the onions. Saute until lightly golden and soft. Add the ginger and cumin and cook for one minute. Add the leeks and courgettes and fry over a medium heat for 3-4 minutes, until soft. Scatter over the broccoli and washed baby spinach and stir until the spinach just wilts and the broccoli is hot. Season liberally to taste. Arrange the sprouting broccoli around the edge of the pan and, using a spoon, make gaps in the mixture. Crack the eggs into these gaps (the aim is for the egg to sit on the frying pan directly and not on top of the greens). Reduce the heat to as low as possible and cook gently until the egg whites are just set. Season with salt and pepper and scatter over the roughly chopped mint and parsley. Serve with lots of warm flatbread.